If you’re over the age of 60 and meet income eligibility requirements, you are eligible to apply for a Senior FarmShare! What it is: Ten weeks of fresh, local produce delivered to participating Senior Centers and Councils on Aging. Shares are valued at $125, and participants pay a one-time fee of $10 during enrollment. How to sign up: Shares are limited and are distributed through a lottery. The application period is open from May 1-June 1st. Step 1: Refer to our list of distribution sites to identify a pick-up site that works for you. Step 2: Contact the site manager to request an application form or click here to apply online. Step 3: Submit the application form by June 1st. Step 4: The site manager will be in touch in early June to let you know whether you have been selected, and the start date for the program. Each distribution happens during set hours at a designated pick-up location. Please ensure that you, or a friend or family member, will be able to make it to the site during distribution hours each week. Unclaimed shares will be donated. Shares will be made up of a mix of fresh, seasonal vegetables each week. You may receive a bag or box of pre-selected produce, or you may pack up your own share with some choice of vegetables. If you have questions about the specifics, contact your local site manager. 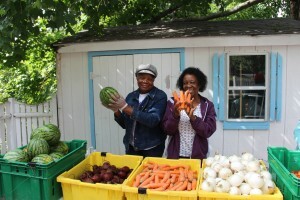 CISA’s Senior FarmShare program has been providing shares of the harvest to low-income seniors since 2004. In 2017, we provided 420 shares through partnerships with 10 farms and 13 distributions sites throughout Hampden, Hampshire, and Franklin Counties. We rely on a mix of state funds and public generosity to provide fresh, local food to a vulnerable population. Donate now (and note Senior FarmShare in the comments) to support this important work! For further information about the program, please contact Mia Kortebein, Program Coordinator, at 413-665-7100. Check out our updated 2017 Senior FarmShare fact sheet for more information on the program.